Judicial Service – Judge James Dickson Phillips, Jr.
Judge James Dickson Phillips, Jr.
Judge Phillips was nominated to a seat on the Fourth Circuit formerly held by J. Braxton Craven, Jr. by President Carter on July 20, 1978 and was confirmed by the Senate on August 11, 1978. Former colleague Judge J. Harvie Wilkinson III wrote that Phillips was “imbued with knowledge and wisdom, devoted to law and respectful of litigants.” More reflections on Judge Phillips’s judicial career appear in A Tribute: Judge James Dickson Phillips, Jr.
Judge Phillips assumed senior status in 1994 and continued to sit with the court through 1999. From his chambers in Durham above the Old Post Office, and later, from his chambers in Chapel Hill, he crafted opinions and dissents that had an impact on constitutional rights not only within the Fourth Circuit but across the nation. In Gingles, black voters in North Carolina challenged a redistricting plan that the General Assembly enacted in 1982. Judge Phillips, sitting on a three-judge district court panel, wrote the opinion in the case, holding that the redistricting plan violated Section 2 of the Voting Rights Act. Phillips found that the plan would result in the dilution of the electoral rights of black voters. The court later approved a revised redistricting plan, which it found remedied the earlier violations. This decision was appealed directly to the U.S. Supreme Court, which largely affirmed the judgment. See Thornburg v. Gingles, 478 U.S. 30 (1986) (affirming the decision with regard to all of the districts except for House District 23, which was reversed). 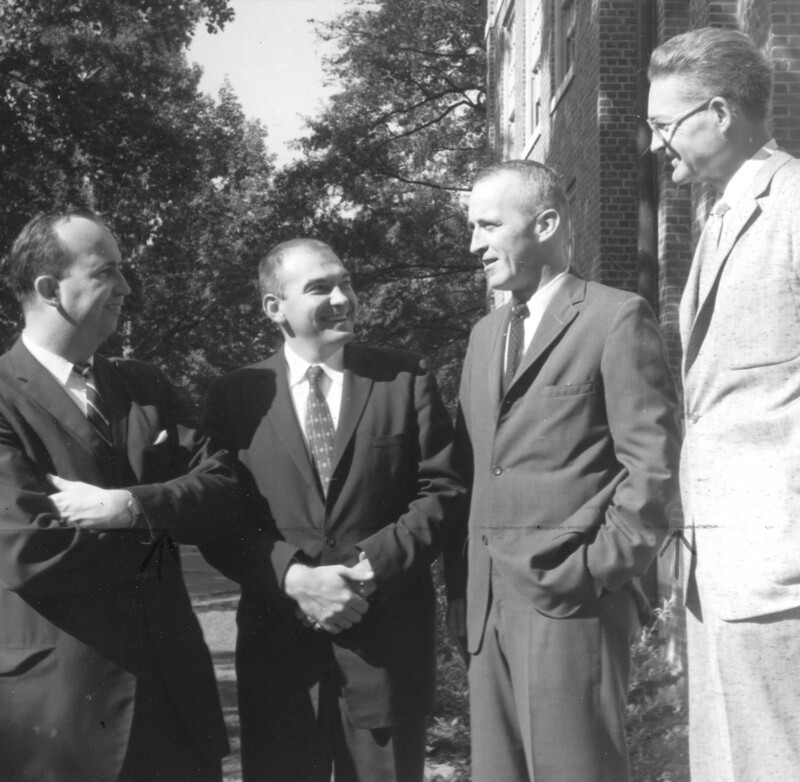 New faculty at the UNC School of Law, late 1950s. Many years later, Robinson O. Everett, far left, was lead counsel for plaintiffs in Shaw I, which was heard by J. Dickson Phillips, second from right. Based on the 1990 decennial census, North Carolina was granted a twelfth seat in the U.S. House of Representatives, leading the General Assembly to create a redistricting plan. In Shaw I, the plaintiffs, white citizens of North Carolina and voters in Durham County, N.C., challenged the implementation of the redistricting plan, which created a new majority-minority district in the state. With Judge Phillips sitting as a circuit judge, the three-judge panel district court dismissed the case for lack of jurisdiction and failure to state a claim. The U.S. Supreme Court reversed and remanded the case to the district court. See Shaw v. Reno, 509 U.S. 630 (1993). On remand, the three-judge panel held in favor of the defendants, finding that the redistricting plan was narrowly tailored to further the state’s compelling interest and that the redistricting plan did not violate the plaintiffs’ equal protection rights. The U.S. Supreme Court reversed this decision, finding that the new majority-minority district was not narrowly tailored to the state’s interest. See Shaw v. Hunt, 517 U.S. 899, 918 (1996). In United States v. Virginia (VMI I), 976 F.2d 890 (4th Cir. 1992), the federal government sued the Commonwealth of Virginia, alleging that the male-only Virginia Military Institute (a state school) improperly discriminated against women by excluding them from the institution. The trial court found in favor of Virginia, and the U.S. appealed. The Fourth Circuit vacated the lower court’s decision, finding that while there was a legitimate reason for single-gender education, Virginia did not justify its policy of only offering the type of training and education to men and not to women. On remand, the trial court judge allowed Virginia to create a similar state-supported all-female program, VWIL, that would be comparable to VMI. On appeal to the Fourth Circuit in United States v. Virginia (VMI II), 44 F.3d 1229 (4th Cir. 1995), the court noted that the all-female VWIL program would be sufficient to meet the requirements of the Fourteenth Amendment’s Equal Protection Clause, even though it was a leadership program, and not military training like that offered by VMI. The U.S. Supreme Court later overturned the Fourth Circuit’s VMI II holding, finding that the VWIL plan did not meet the requirements of the Equal Protection Clause, agreeing with many points in Judge Phillips’ dissent. See United States v. Virginia, 518 U.S. 515, at 529-30, 553 (1996). On the Shaw and VMI cases, see Hampton Dellinger, Modernizing the ‘New South’: The Legacy of Judge Phillips’s Late-Career, Late-Century Rulings in Shaw and VMI, 92 N.C. L. REV. 1795 (2014).